The Athabascan people are largely defined by their language, and Athabascan languages are spoken in large areas of Alaska and Canada, as well as in the American Southwest and on the Pacific Coast as far south as northern California. The Athabascan language family has, in fact, the greatest geographic spread of any language family in North America. Because of this, great diversity is to be found among the Athabascan peoples. It is therefore difficult to make generalizations about "Athabascan culture" or "Athabascan history". There are, in fact, many Athabascan cultures and many Athabascan histories. Nevertheless, we do know that the Athabascan languages are related to the Eyak and Tlingit languages, which are spoken mainly in Southeast Alaska. It seems likely that the homeland of all three peoples was originally in this area, perhaps on the coast or more likely in the interior, including the large lakes that form the source of the Yukon River. From here Athabaskans could have spread west along the Yukon and Tanana Rivers into Alaska and south into British Columbia, Canada. It is evidently from this southern part of the homeland that various bands of Athabascans accomplished other great migrations: south along the Pacific Coast, down along the other side of the Rocky Mountains into the American Southwest, out into the northern Great Plains, and throughout the northern interior of Canada as far east as Hudson Bay. Anthropologists believe that these expansions were facilitated by the distinctive hunting techniques of the Athabascans, often involving the entire community, as when they would drive game animals into a "bottleneck" or narrowed place where they could easily be killed. This communal hunting style gave them a competitive advantage, making it possible for bands of Athabascans to flourish in marginal areas where other groups found it difficult to survive. Some archeologists also think that the Athabascans introduced the bow and arrow onto the Northwest Coast area many centuries ago, since this weapon appears to have spread down from the north just at the time when we would expect the Athabascan migration to have occurred. Athabascan cultures also tend to be extremely conservative, and this conservatism has encouraged the development of a complex societal structure and a complex language. Athabascan languages are in fact famous for their intricate, unusual, and subtle structure. This complexity has historically made it extremely difficult for outsiders to learn to speak Athabascan languages. In bilingual situations, therefore, it was more usual for Athabascans to learn their neighbors' languages than the other way around. Furthermore, before European contact, Athabascan groups tended to borrow very few words from neighboring tribes, preferring to rely on the resources of their own language. It is perhaps this conservatism and self-reliance, above all else, that has remained the backbone of Athabascan language and culture. Athabascans probably entered Alaska from present-day Canada via the Yukon and Tanana Rivers. The Deg Xit'an-Holikachuk group probably represents the most ancient migration down along the Yukon River. In eastern Alaska, Upper Tanana, Han, and Gwich'in have rather recently undergone radical sound changes similar to those of Northern and Southern Tutchone (western Yukon Athabascan). The homeland of the Athabascans may have been largely in the present-day Yukon Territory and northern British Columbia, Canada. This area is home to highly diverse languages. 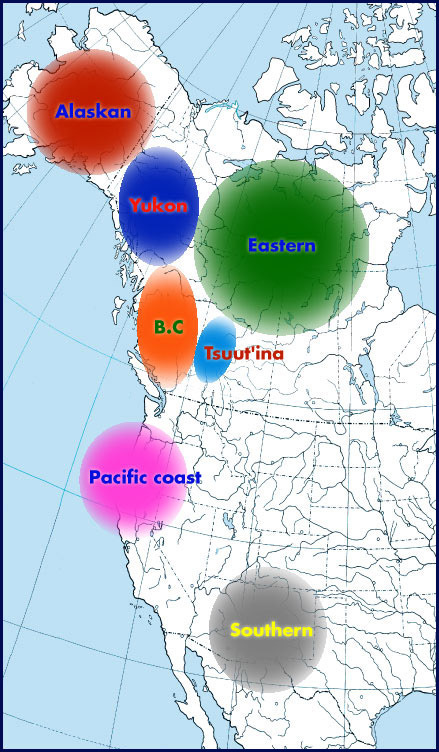 From here the Athabascans spread northwest to Alaska and southeast to southern B.C. Offshoots soon spread further to the south and later to the east. The northern part of British Columbia may have also been part of the early Athabascan homeland. The southern B.C. languages belong in a separate group. In some of these languages, vowels have been affected by the neighboring consonants. This large group in eastern Canada appears to represent a relatively recent spread from B.C. Slavey influence has spread back toward the west, and is especially important in Beaver and Sekani. In many Slavey communities children are still learning the local language. This group moved onto the northern plains several centuries ago. Tsuut'ina, although basically a Canadian Athabascan language, shows certain ancient affinities with Southern Athabascan and Pacific Coast Athabascan. This group seems to have migrated down from the southwestern B.C. area to the American southwest about 1000 years ago. Navajo is the largest and best known Athabascan language, and is still learned by children in some areas. This ancient and diverse group spread along the Pacific Coast of the U.S. represents a very early migration, or a series of migrations, from the southern B.C. area. Groups of Athabascans settled in present-day Washington, Oregon, and northern California. Most of these languages are now extinct.